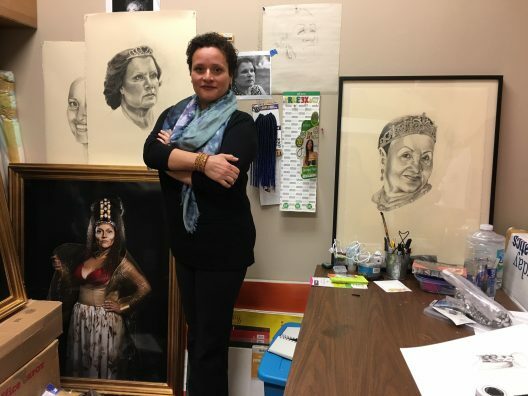 Raimundi-Ortiz in her UCF studio, surrounded by her sketches and portraits of previous "Reinas/Queens." Wanda Raimundi-Ortiz feels she represents more than just herself in her art. When she is creating, she feels the characters bursting forth to tell their stories – and all the while she struggles with all they represent. Raimundi-Ortiz’s new creation, Pieta, tells the powerful story of the fear of losing a child to violence and intolerance, and will be featured in the prestigious Smithsonian Identify: Performance Art as Portraiture series on May 6 in Washington, D.C.
Pieta is the newest installment of Raimundi-Ortiz’s “Reinas/Queens” series, where she develops regal characters that speak to broken relationships, racial intolerance, anxiety and other issues often affected and defined by race and ethnicity. In Pieta, Raimundi-Ortiz reimagines Michelangelo’s iconic Renaissance sculpture of the Virgin Mary holding her deceased son, Jesus, but with her own artistic twist. As with the others Queens in her series, like the “Bargain-basement Sovereign” and “Gringa Reina,” Raimundi-Ortiz taps deep into her own fears, anxieties and grief to create Pieta. The latter is deeply rooted her worries as a mother to a young child. Locally, she’s performing 6 p.m. March 21 at the Knowles Chapel in Rollins College. The performance is free and runs approximately 90 minutes, with Raimundi-Ortiz in her elaborate costume holding her volunteers for 3 minutes and 33 seconds each. As with other Raimundi-Ortiz productions, every detail has meaning. Each is carefully considered. She wanted to use Knowles Chapel because it is beautiful, and represents an affluence just a short distance from the historically black, but increasingly gentrified neighborhood of Hannibal Square in Winter Park. There is dramatic lighting, and Raimundi-Ortiz worked with Amy Galpin, Rollins’ Cornell Fine Arts Museum curator, to bring the physical vision of Pieta to reality. The music is curated spanning different decades, heavily influenced by Latino singers and musicians, and includes a special performance by the UCF Gospel and Cultural Choir. Her friend Alejandro “Stereo 77” Ramirez worked with her on the sequences. The costume, designed by UCF associate professor and costume designer Kristina Tollefson, weighs more than 20 pounds and reflects the Renaissance, with contrasting silks and velvet that are both heavy and shimmery in light. Her headpiece resembles a halo in the Catholic tradition, but is made of ethnic hair weaves, braids and some “bling,” Raimundi-Ortiz said. Also, she needed 33 volunteers who are people of color to hold. She’s asked friends and students, and reached out to the local LGBTQ community. She embraces them, she said, “because it’s almost like we all need to be consoled, to be held” in dark times. In creating Pieta during the past year, she thought about the shootings of black youths that made national headlines, and was deeply troubled by increased intolerant rhetoric in national politics. Raimundi-Ortiz’ “Reinas/Queens Series” so far has produced five characters which she has performed locally and in New York. More information on the Pieta performance May 6 in the Smithsonian’s National Portrait Gallery is available here. Recently nominated for the prestigious 2016 United States Artist fellowship, Raimundi-Ortiz was named one of 2016’s Women Making History by UCF’s Center for Success of Women Faculty. She was a 2016 Smithsonian National Portrait Gallery’s Outwin Boochever Portrait Competition semifinalist and top 10 finalist for the statewide 2015 Orlando Museum of Art Florida Prize in Contemporary Art.